I recently took a briefing from Intacct (more on them here) giving me an update on their Q2 performance and also appraising me of product changes rolling out this summer. First some interesting business performance statistics. I was interested to hear from Intacct that their biggest market competitor isn’t another accounting vendor, rather it’s customers who are in a holding pattern and avoiding making decisions about cloud accounting. In terms of product competitors, NetSuite is, unsurprisingly, their biggest competitor but interestingly enough a couple of the other likely suspects, FinancialForce and Acumatica, don’t feature in here. Intacct reports that FinancialForce is, by their observation, only gaining traction in situations that are very sales centric. Also interesting to hear Intacct’s observation that it is the business process outsourcing style of firm where they are seeing real momentum. Their belief is that the value that firms get from moving all their clients onto one solution is sufficiently compelling to swing the deal their way. It’s an example of when a mutually beneficial channel strategy can drive real value for both parties. Anyway, on to product news. The big announcement for this season is a strong move by Intacct into the professional services automation (PSA) space. I’ve written in the past about PSA, and explained how it really is an emerging market. With this move Intacct goes head to head with NetSuite and the OpenAir product they acquired some time ago. As an adjunct to this development, Intacct has inked a deal integrating with Clarizen to automate the work management aspects of PSA. 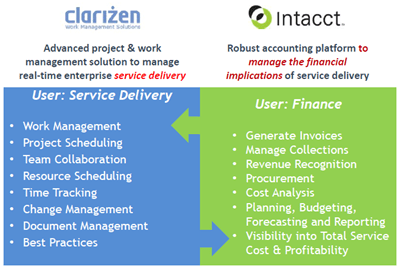 It’s a cloud approach towards building a truly integrated suite – take Intacct’s financials, build a PSA tool set on the side and bolt on work management from Clarizen. Looking at screenshots and workflows its a nicely executed piece of work. Finally for 2010, Intacct has begun a redesign of all the user interfaces of its application. They hired the designer that was responsible for the look and feel of mint.com, and are using that skill set to create a much more usable and intuitive application overall. Lots of information in there, some company updates and some product news. All in all it’s good to see Intacct seemingly going from strength to strength.